A warm comfort food dish after a long and tiring day at work is all I need. It was such a great hit, and I had to share it with you. 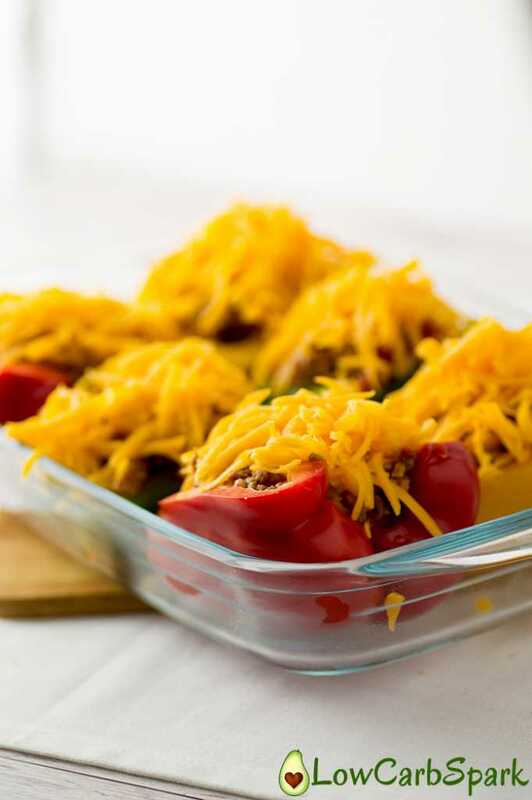 All my non-keto family members loved these colorful stuffed keto peppers, and there’s no wonder why. 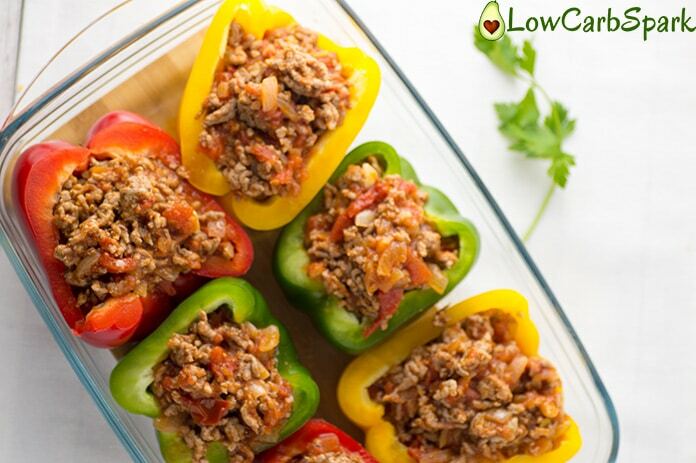 The juicy flavored ground beef stuffing and the perfectly fresh peppers are packed with such great nutrients and vitamins. One serving of my keto stuffed peppers provides 123% of the daily recommended intake of Vitamin C.
3 Medium Peppers, any color you want. I loved the red and yellow ones. 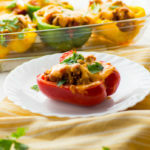 How to make keto stuffed peppers? 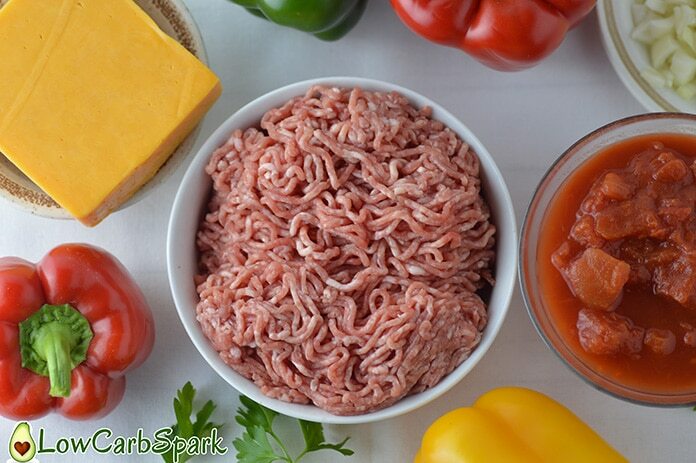 To make keto stuffed pepper we have to omit the rice that is usually used in the classing filling. Take care of the Peppers. 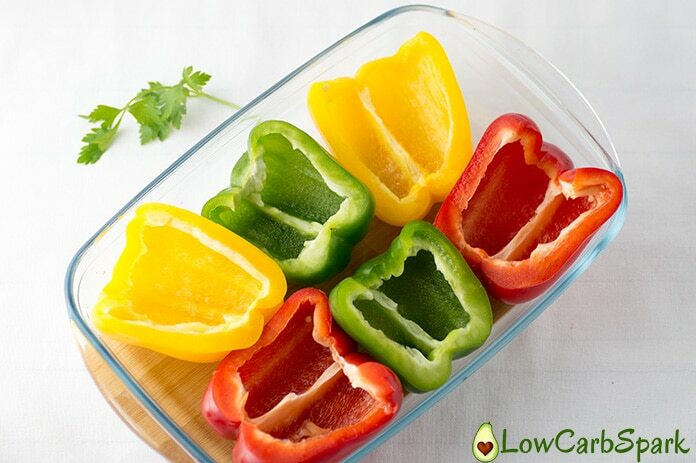 Gently wash the peppers and remove all the seeds and membranes from the inside. Sprinkle some salt over them. Make The keto stuffing for the peppers. It tastes like lasagna without all the carbs. Season the meat lasagna stuffing to taste. Fill the peppers with the lasagna stuffing, sprinkle cheese on top and bake for about 15-20 minutes! That’s it – so easy and delicious! 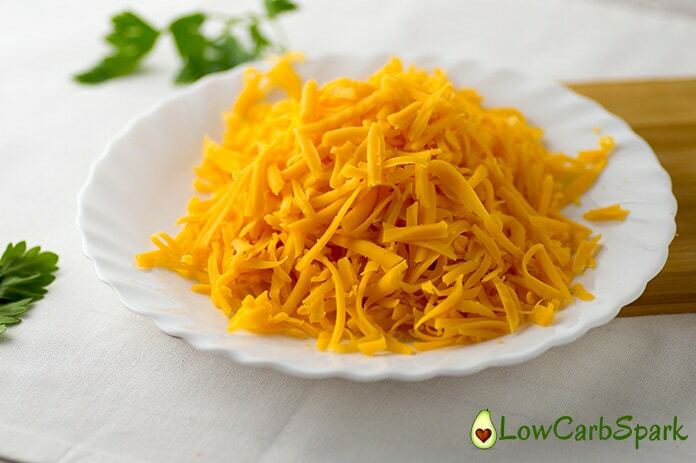 The pre-shredded cheese usually has added agents like potato starch to prevent clumping and has more carbohydrates. I used aged cheddar cheese because it has a stronger taste, but you can use any kind of cheese you love. Mozzarella would be a great substitute. 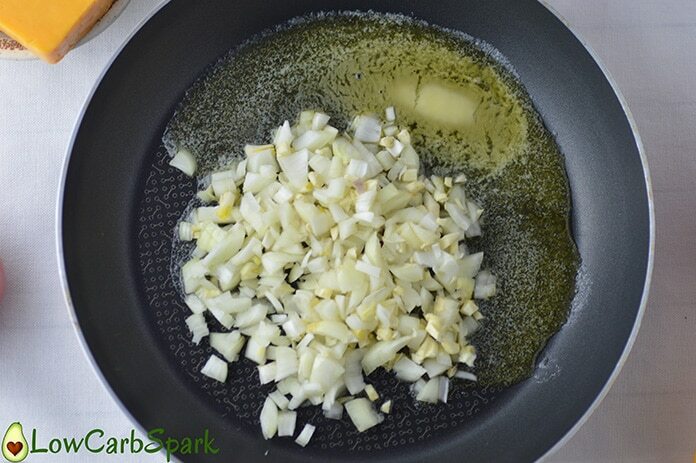 Add more oregano, and you will have a fabulous keto Italian meal without all the carbs from their classic bread and pasta dishes. For the keto pepper’s stuffing, you will need to chop one medium onion and 2 cloves of garlic. Add them in a pan with 2 tablespoons butter over medium heat until it gets a nice golden brown color. Use a food processor if you’re like me an cry like a baby when it comes to cutting onions. After about 8 minutes it’s time to add the meat. While cooking, use a spatula break up the meat. I added pink Himalayan salt, chili powder, black pepper, dried oregano leaves. Let your taste buds guide you through this step. After adding the tomatoes add more seasonings if you feel like it. This is how the mixture looks before I add the tomatoes. Smells and tastes amazing. I could easily just sprinkle some cheese on top and have a nice quick low carb lunch. Tomatoes when it starts to feel like keto lasagna. 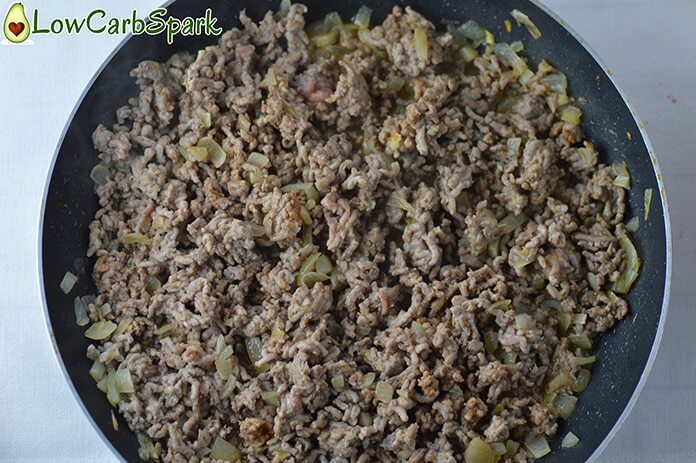 The ground beef mixture is ready to be added to the peppers. 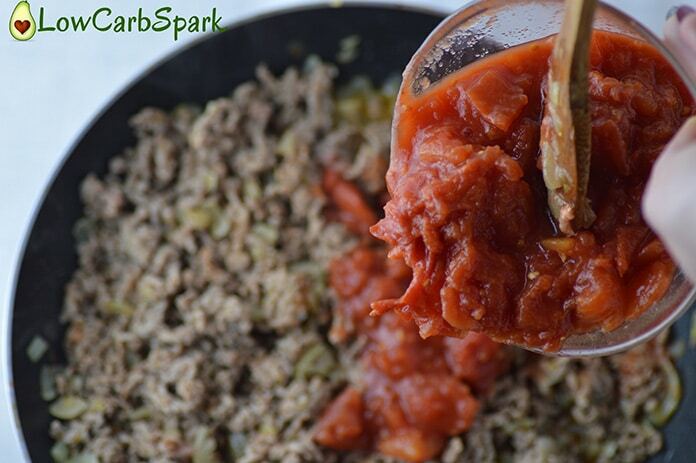 Spoon 3-4 tablespoons of stuffing in each pepper. As all the meat is covered in delicious freshly grated cheddar cheese take these beauties to the preheated oven. After 15 minutes take them out of the oven and sprinkle with fresh parsley. 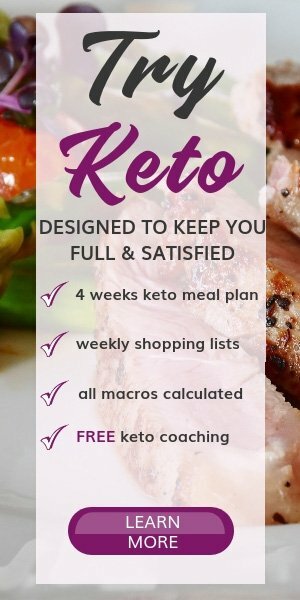 Can we eat tomatoes on a ketogenic diet? Yes, tomatoes are ok to eat. Don’t be afraid to eat tomatoes on a ketogenic diet. One cup of tomatoes has only 4g NET carbohydrates. Tomatoes are a great source of Vitamin C, Vitamin A, potassium, manganese and provide tons of fantastic health benefits. Are red peppers OK on a keto diet? Red peppers are allowed and ok to eat on a ketogenic diet since they are very low in carbs and have fantastic macros. A warm comfort food dish after a long and tiring day at work is all I need. It was such a great hit, and I had to share it with you. All my non-keto family members loved these colourful stuffed keto peppers, and there’s no wonder why. Rinse the peppers and cut them in half lengthwise. Remove any seeds and membranes. Peel onion and garlic. 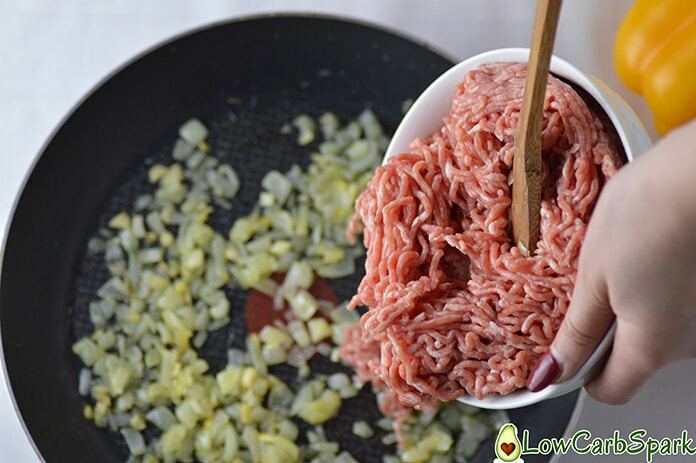 Finely chop the onion and mince the garlic. In a non-stick skillet over medium heat, melt the butter. 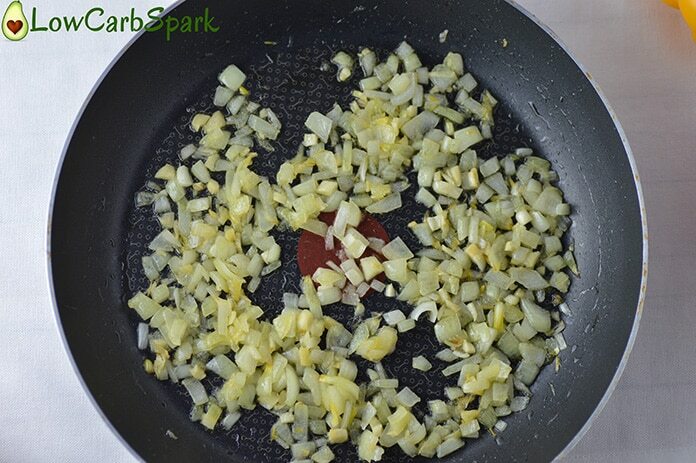 Add the chopped onion and garlic and cook for about 8 minutes. Stir occasionally until golden-brown and softened. 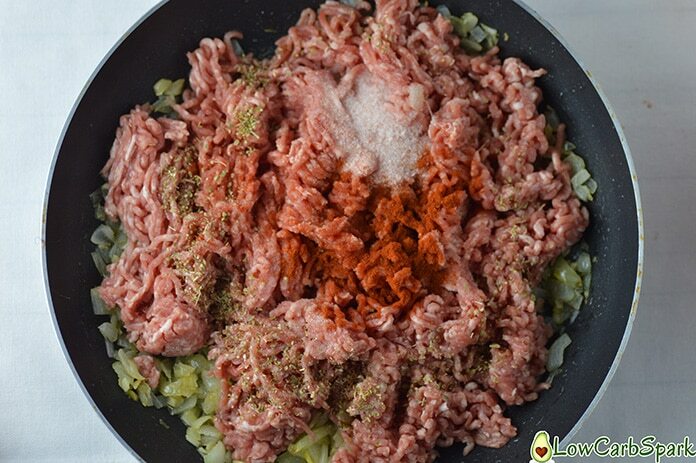 Add the ground beef and the seasonings. Using a spatula break the meat up as it cooks. Let the meat cook for 8-10 minutes. Remove the stuffing from the heat. Evenly divide the stuffing in each half pepper. Sprinkle each pepper with the shredded cheddar cheese. Bake until the cheese is melted and the peppers are a little bit softened. Cool them for 5 minutes before serving. 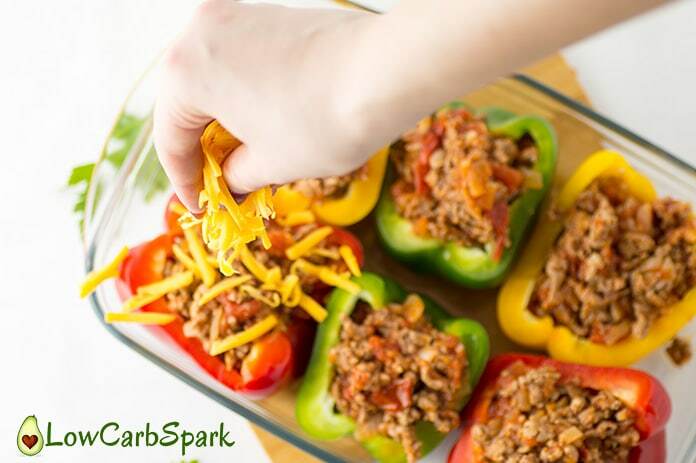 Have you tried my easy keto stuffed peppers recipe? Let me know how great they turned out in the comments below. I just finished eating my first stuffed pepper, and it was DELICIOUS!!!! I only used 1 teaspoon salt and one teaspoon pepper, and it was perfect! Thank you for sharing the tasty recipie! I am so happy you enjoyed the recipe. It's one of my favorites too. I'm confused about the peppers and serving size. Is a serving size 1 full pepper whether green, red or orange. Therefore should the recipe say red, yellow or green? Or for the recipe for one serving do you need 3 whole peppers. 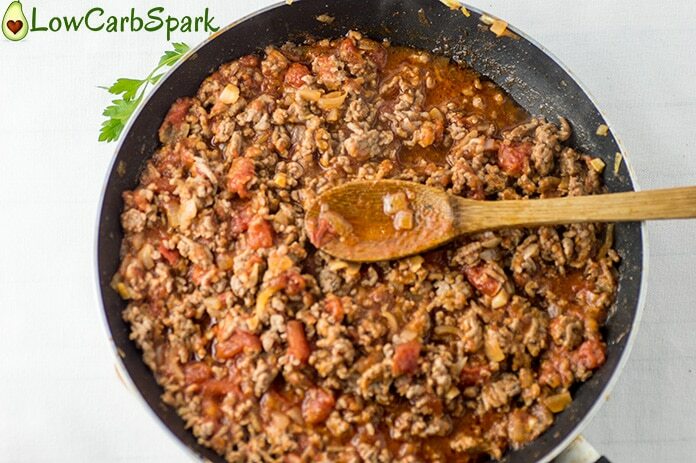 I made it for six servings (1# ground beef) but only used 2 peppers cut in half. 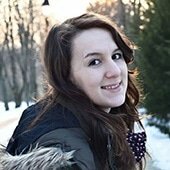 I'm trying to figure accurate carbs and fats. Love the recipe! The serving size is one half of a stuffed pepper and it's very filling. I am happy you like the recipe because it's one of my favorites too. Boil 2 green peppers until slightly soft. Mix 4 oz. fatty hamburger, 1 egg, 1/4 c low carb pizza sauce, tsp, garlic, T chopped onion, 1/4 c shredded cheese. Divide in half, in each pepper. Add 1 T. pizza sauce and cheese on top of each. Bake 350, 30 minutes. Very low carbs. Yummy!! Dianne, your idea sounds brilliant. I should definitely try it when pizza cravings kick in. Thank you for the comment! Oh my! My family loved these. My husband took leftovers to work and a coworker asked for the recipe. Making them again tonight. Sounds terrific. I super happy all of you loved the recipe! Hello Dana! I am so happy you all loved my recipe! Delicious…so tasty. I will be making this again next week. I just had to substitute oregano with Italian seasoning and thyme. Love love love it. Thank you!! Hey Lisa. I super happy you loved the recipe. The seasonings are up to your taste and the one you used are some of my favorites too. Definitely a versatile recipe! Do you cook the peppers before you stuff them? and if I want to make them and freeze them for later, do I bake them and then freeze or freeze them before baked?? Can't wait to try the recipe…sounds so good! Wondering if this recIpe fOr These peppers Should Have foil over while baked, also how Long do we baKe them? I didn’t use foil when baking, but the peppers were a little crunchy. If you want them more on the soft size you can use foil.